OK so if you’re reading my blog you’ve most likely surmised that the name is a play on Michael Pollan’s book “The Omnivore’s Dilemma”. That is a correct assumption. I read this book over the summer and it changed the way I eat and think about food. I’ve always been aware of the fact that eating food straight from my garden is 100 times better for me that the produce in the grocery store, but perhaps I just wasn’t as devout about my decisions on the age-old question “What’s for dinner?” Pollan takes his readers through the process of preparing four very distinct meals: one fast food, one organic industrial, one organic pastoral, and finally one where he foraged all ingredients himself. I have to say my favorite part of this book is when he was visiting Polyface Farm in Virginia’s Shenandoah Valley. Owner Joel Salatin easily became my hero of all heroes. Grass farmer by trade, advocate, and inventor, Joel is the king of organic pastoral. I wish he and his farm were in Connecticut. As a scientist interested in obesity research, I have always been fascinated by the world of food policy and sustainable agriculture as well. Pollan touches on these topics providing some history about the American farmer and how they’ve gone from feeding local families with a variety of products to feeding families thousands of miles away with only one product: corn. I bet you thought that “America runs on Dunkin”, but nope, it runs on corn. While at Polyface Pollan discusses the ethics of eating meat as he partakes in the slaughtering of chickens on the farm. It’s not a pretty thing to imagine, but if you’re a meat eater then you too are involved in the killing of animals and there’s just no escaping that fact. As he discussed his woes about the process, it brought back some memories from when I was a child. I grew up on a farm in the Hudson Valley and while I’ve never actually slaughtered a chicken myself I have seen it done first hand. I can remember going in to the hen house each day to collect fresh eggs. I can remember being so excited when the baby chicks arrived that I would spend hours after school just sitting in the granary watching them peep and stumble about. I can remember the sound of them waking me up on a weekend morning. Also, I can remember seeing them hung on a post by their legs and having their throats cut and bled out in to a bucket below. You might think this is a terrifyingly gruesome image for a child to see, but actually, it was just another day on the farm. And those same chickens that I had watched grow from chick to dinner would provide me and my family with organic protein for many meals to come. The ethics of eating animals is a tough thought to wrap your head around, but I believe it’s an important thing for carnivores to think about. How many of us take responsibility for eating meat? When you sit down to a nice dinner of filtet mignon do you stop to wonder where that cow came from? If he was humanely treated? If he was allowed to graze on sweet grasses and roam acres of land or if he was forced to eat grain all of his life while standing side by side with thousands of other cows in a foot of manure? I suppose the vegetarian perspective would be that even the former is still murder and therefore wrong. All I’m asking is that if you do eat meat to take the time and make an educated choice about where it’s coming from. It is your choice. Take responsibility for it. I digress, but now back to the book. Like I said earlier it really did change the way I eat and set me on this whole new local organic journey. 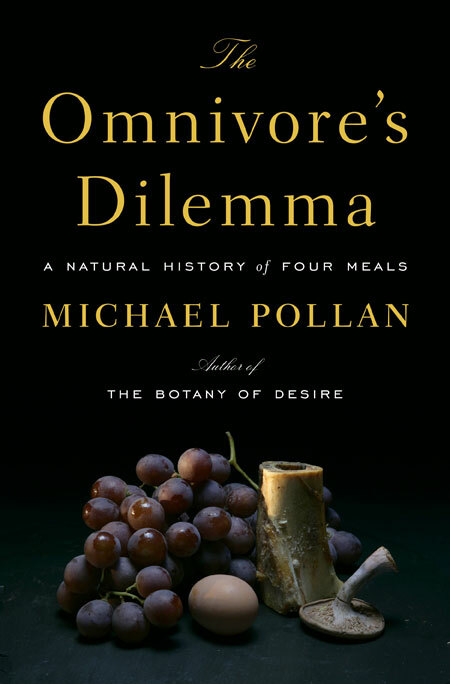 This is why I started this blog, because I, like Michael Pollan, am an omnivore (a Connectivore more specifically) and I too have the same concerns, questions, and thoughts about what to eat and where to get it from. This is our dilemma. Entry filed under: Books. Tags: Animal Ethics, Food, Joel Salatin, Michael Pollan, Organic, Polyface Farm, The Omnivore's Dilemma.